When uplifting inspiration is the order of the day, this timeless arrangement of lilies, hydrangea and spray roses in white resonates with a modern twist, adding various eye-pleasing greens and the zen-like feel of river rocks. 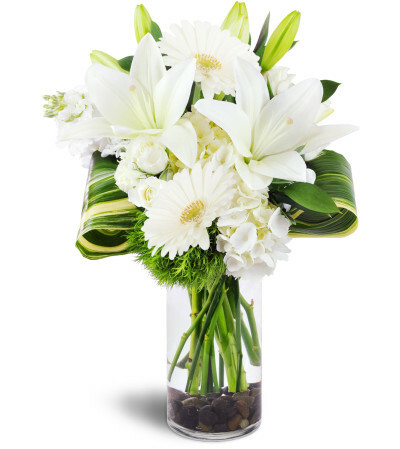 Your excellent taste is apparent for all occasions with this sophisticated, sleek floral gift. 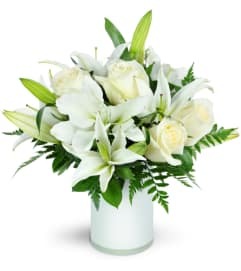 White lilies, white hydrangea, white spray roses, and white stock blooms are arranged with green dianthus, aspidistra, Israeli ruscus, and river rocks in a clear cylinder vase. Our family has purchased things from here for many years, and they always do an excellent job. 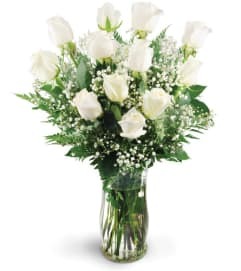 Timp Valley Floral has been a part of our family for many years. They've provided flowers for two weddings, two funerals and many occasions every year. Along with beautiful arrangements, their patience and kindness has been appreciated. This is seriously the most beautiful corsage ever! We ordered it for my son for his prom date. We paid a little more for the keepsake bracelet and did all of this over the phone. I told them the colors of her dress and shoes. They picked beautiful flowers, and the bracelet couldn’t have been more perfect. It was worth the extra! I live in Orem where there are plenty of florists, but I drive to Timp Valley Floral 3 cities away because of the quality and price. Highly recommend them to anyone in the market for a corsage!! Timp Valley Floral is a Lovingly Florist in American Fork. Buying local matters. Discover how Lovingly supports local florists. Copyrighted images herein are used with permission by Timp Valley Floral.